A 125 cc adventure bike by TVS was recently caught testing in India fueling rumours of an imminent launch of an off-road capable commuter bike. 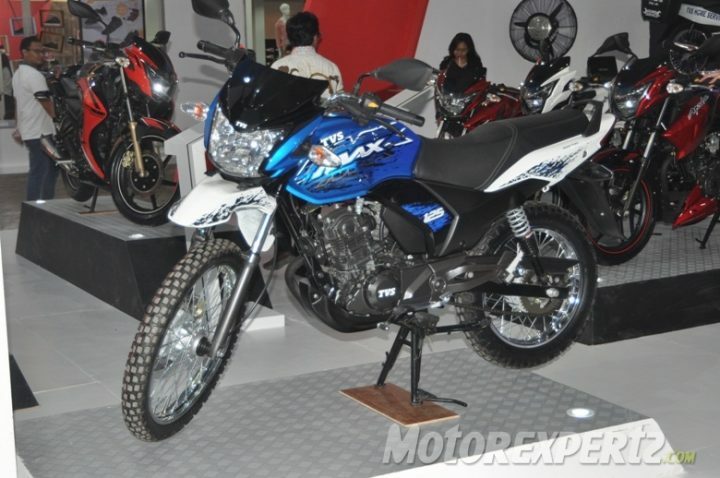 Soon after this TVS launched the Max Sport Semi Trail in Indonesia powered by a 125 cc engine ending speculation regarding any such launch in India. But the TVS 125 cc Adventure bike could still find its way to India to give the Hero Impulse some competition. If launched, the bike is expected to cost somewhere between Rs. 55,000 to Rs. 60,000 but since there has been no official announcement launch dates cannot be confirmed just yet. The TVS 125 cc adventure bike gets a raised front mudguard with off road tires along with a long travel telescopic suspension and a longer pair of shock absorbers for the front and rear respectively. The bike also gets a larger front rim, petal discs, alloy foot rests and an exposed chain. The Max Sport Semi Trail is based on the TVS Max commuter bike also sold in Indonesia and is powered by a 124.5 cc four stroke engine, which does duty on the Phoenix, producing 11 BHP@ 8000 rpm and 10.8 Nm of torque @ 6000 rpm mated to a 4-speed transmission. Enthusiasts have been demanding an adventure bike from TVS. It has tasted great success racing 250 cc dirt bikes, but those enthusiasts might be a tad bit disappointed with a commuter based adventure bike rather than a proper 250 cc version. As of now it is unclear whether the Indian market would get a TVS 125 cc adventure bike based on the Max Sport Semi Trail but it would definitely be a very interesting addition to the company’s portfolio. What do you think? Would you be interested in this bike if the company launched it in India?